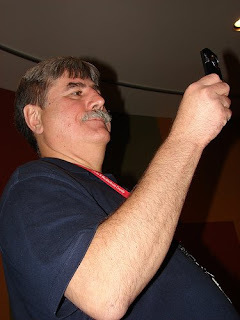 Hey, guys, 'tis I, the Great and Powerful CARLMAN, back and blogging after a week away from the library. I had to take a week off because my wife fell and broke an ankle last Monday. She SAID it was from playing with our daughter in the driveway, but she HAD to say that to protect her secret identity. She was really defending the city against a crime wave. There she is in action. She's OK now--or as well as you can be with a broken ankle! These books are really funny and the audio version is just as good. In fact, you'll laugh out loud. Alvin Ho is a second-grade kid who's scared of everything--school, piano teachers, wild animals in the woods, tornadoes on camping trips, and more. This audiobook is especially funny because it's read by a real kid, a guy probably about the same age as you! It's extra funny when the boy tries to sound like Alvin's dad! 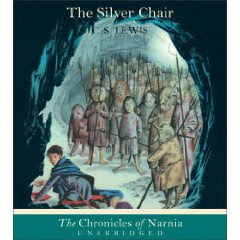 All the Narnia books have a lot of action, but this one has more than most. Two school kids, trying to escape from bullies, find a door that leads into Narnia. Aslan, the great Lion, gives them the assignment to find the lost prince who was enchanted and stolen from Narnia ten years before. The actor who reads it is very good and holds your attention from beginning to end. A fascinating look at what life was really like in the Middle Ages. A young boy, whose father is off at the wars and mother is in London attending to the Queen, contracts the plague and is crippled. The servants leave him by himself, alone in bed and unable to walk! Does he ever get rescued? Does he ever recover? And what happens when the hostile Welsh surround the castle? You've got to listen to find out! I'm cheating a little bit here because I've listened only to the first disc but it's alrerady funny! Ramona Quimby is one of the greatest pains you'll ever meet and here she starts kindergarten. You'll laugh when tries to "sit here for the present" or asks a question about Mike Mulligan. These books are great for the car or if you have a personal CD player. Nothing better to make the miles fly by! Hit the "audiobooks" tab below if you want to find out about more good reads--I mean "listens"! it's fun to say "farts"
Hello guys in blogville, Master Jedi Zack here with a book that has the word "fart" in the title. I think everyone would agree that the word "fart" is just way too much fun to say. So everyone say it with me... FART! Okay, there is actually a book I want to talk about here and it is called Bubble Homes and Fish Farts which is a super cool non-fiction book about things that live in and around the water. The book talks about all sorts of animals that use bubbles in really cool and interesting ways. And you probably guessed, it even talks about fish farts, and that just makes me smile. Superheros and Swords - Too Cool!!! Marvel Adventures Fantastic Four: Four-Three-Two-One by Paul Tobin, Denise Medri, Vinenc Villagrasa and Pete Perez - Wow!!! I have read a bunch of Marvel Adventures Fantastic Four but this I would have to say is the best so far. This volume collects Marvel Adventures Fantastic Four 45-48. The storytelling is tight and the artwork simply awesome. The first story is more along the lines of comedy with a villain named Mordecai Midas, with the help of Madam Masque, trying to trick the Fantastic Four into letting him join the team. My favorite story in the collection is called "Moving Day" and features no other than Galactus "The Devourer of Worlds." This story is set at the end of time with the birth of a new Universe on the horizon. Galactus must be the only living thing to move from this Universe to the next, but meets resistance in "The Black End" composed of Annihilus, the Kree Supreme Intelligence, one of Galactus' former heralds Air-Walker, and others. He summons the FF to the end of time for help against these foes or does he? This story has a twist ending that I just thought was great!!! For the other two great stories, check this GN out and I promise you will not be disappointed. Speaking of comics, there is one that I picked up recently at Heroes Arn't Hard To Find that I would like to give a shout out about. It's called G-Man: Cape Crisis by Chris Giarrusso. This is a very funny and entertaining comic to read, so if you get the chance and have the money think about picking it up. Swords: An Artist's Devotion written and illustrated by Ben Boos - Some of you may not know this, but I have a large collection of swords and ancient weapons. Well one of my co-workers who knows of my love for ancient weapons gave me this really cool book to checkout and read and man it really was something else. I really cannot tell you the number of swords from different times this book talks about and shows examples. Swords and weapons from their earliest apperance and from different cultures are discussed and shown and leave you wanting to know even more. 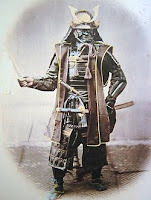 Some of my favorite chapters in the book concerned swords associated with the Landsknechts (famed mercenaries of ancient Europe), the Samurai and Ninja of ancient Japan and Warriors of ancient China; but really all the cultures and people discussed and the swords they used really got me pumped up. I really enjoyed this book and highly recommend you take a look at it if ancient weapons and swords interest you. Most Excellent Indeed!!!!!!!!!!!!!! 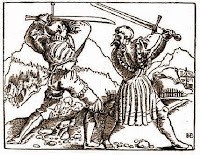 Early 16th century Landsknechts fencing!!!! Finally their was a comment on the August 12, 2009 Post "Captain America and Bone"by No Name: "Captain America is waaayyy better than Bone. Captain A has that shield and Bone has nothing." I loved this book and it made me think alot about how the author left open in the end. It made me wonder if there could possibly be a sequel to this book. But the thing about this book is that even if emma clayton doesn't write a sequel to this book she gave us the seeds to comtemplate whether mika and ellie will survive through this new future and actually made this evn more exciting. Do you know if for sure if there is going to be a sequel or be made into a trilogy for sure? Oh and I think I figured out who the Green man was but I'm not sure entirely but the way the author put the quote in at the end fits the book's entire meaning that the author is trying to express throughout the book! PS--will there be a sequel? Just found out there will! It''l be a two-book series instead of a trilogy! Oh, boy!! Can't wait! Kaza Kingsley has done it again!! In Erec Rex: The Search For Truth, she has written another wonderful chapter in the ongoing saga of Erec Rex, the kid born to be king. These books are full of humor, excitement, magic, danger, more magic, more danger, more humor, and more action. Oh, and did I mention that Erec sometimes turns into a dragon? There's a lot that happens to our guy in this book and it just gets harder and harder for him. As I said, this is a terrific read and I heartily recommend it. I do have a little criticism, however. There were some places in which I didn't feel the emotions I needed to feel as strongly as I should have. Does that make sense? For example, in one place, Erec has to grab a manticore. That sound pretty dreadful, right? Well, I didn't feel the suspense and horror as much as I thought I would have. Maybe there needed to be a sentence of description showing us what it was like to grab hold of that monster. Now I know too much description bogs down a good story, but just a sentence or two would have heightened the effect. That's how I see it, at least. Maybe you'd disagree with me. Hit that comment button below and tell us! Hey boys! Evil Ellen here. I'd just like to say that it was an honor choosing the punishment for Carlman (a.k.a. Miss Carlotta), though it ended up being way more fun than a punishment should be. I'd also like to put a warning out there that watching this may not be safe for children under the age of ten. Well, truthfully it may not be safe for anyone. Oh well. Enjoy!! I don't know---maybe kids under ten will laugh the loudest! Enough talk! Heeeeere's Carl! Hey Guys, Master Jedi Zack here. All I can say is Darth Bill must have had something to do with this! I think it is going to be very hard for THE CARLMAN to enforce balance in the force without Darth Bill and I bursting into laughter. Evil Ellen is truly truly Evil for this and I think we might need to start calling her Evil Evil Ellen just to be safe. Greetings all in the Land of Blog. Darth Bill "Prince of Evil (but not so evil as Evil Evil Ellen)" here. I just want you all to know that I am distancing myself as far away (like a gallexy, far, far away) from this video. It is disturbing not only to Jedi, but we Sith as well. Watch only if you are ready to lose lots of sleep. Sigh....what has become of this once pround and noble blog? It's just gotten better, in my opinion! I'll be available for autographs in the lobby. I think I see a CD in the future--"Miss Carlotta Sings 'The Who'"!!!! Oh, yeah!!! Hey Guys, Master Jedi Zack here once again. Just like THE CARLMAN, I have been crazy busy this summer (not to be confused with just plain CRAZY like Darth Bill) and so I didn't post about as many books I would normally. I did help lots of guys who came into my library find great books, does that count?! Awhile back, I talked about the first book in the Something Wickedly Weird series called The Wooden Mile. I have recommended this book to just about every guy who comes into my library and they all love it. If you haven't read it yet you really should go pick it up, 'cause it is awesome! They are also good quick reads just like THE CARLMAN talked about in his last post. Now the library has books 2 (The Icy Hand) and 3 (The Silver Casket) of the series. If that isn't enough for you book 4 (The Darkling Curse) is on its way as well. I haven't yet read past book 1, so I guess I have a project for the fall once all you guys are back in school and my library gets all quiet and boring once again. Hey, all you reader guys out there, it's Carl with the Summer Reruns. There is where I recycle reviews of old favorites. It's summer, it's hot, we've been busy, and I haven't been able to finish anything new lately. So here are some links to old reviews. These are really good books that deserve more attention. Most of them are rather short and can be read quickly, which can be a good thing in these days before school. I'll start with the most recent reviews and go go the oldest. (btw, some of these posts refer to events going on at the time. Don't let that confuse you) Click on the title and see the full review. How To Eat Fried Worms by Thomas Rockwell--a laugh-out-loud funny book. Especially good for summer. The Last River by Stuart Waldman--What a great adventure! And it really happened! The Jungle Books by Rudyard Kipling--a true oldie but goodie. These stories are about as far away from the Disney version as you can get! No custesy, cuddly animals here but real and savage nature. And the real Ka the Snake is one of the spookiest creatures you'll ever meet. Being Teddy Roosevelt by claudia Mills and Stone Fox by John Gardiner--Good quick reads. The first one talks about the power of reading to change your life and the second is a terrific adventure story. 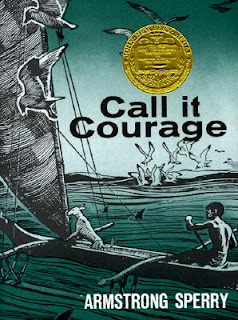 Call It Courage by Armstrong Sperry and Black Whiteness by Robert Burleigh-- call me sentimental but these are the first reviews we did. And these are still two of the best books I've ever read. Unforgettable survival stories! Hey, Bill and Zack, do you have any old favorites you'd like to tell them about? Hurricane Gold is coming out soon, and I think I saw a fifth book out in the UK. David Gilman has a new spy one coming out soon, too. Ice Claw, I think! Thanks for the heads up Ms. Yingling. I am reading the second Young James Bond book as I write this (Blood Fever). Marvel Adventures Superheroes #12 "Featuring" Captain America by Scott Gray, Matted Lolli, Roger Langridge and Craig Rousseau - This issue features Captain America in both the past and present. In the first story we find Cap trying to find his way in the modern world after he has been rescued from being frozen in time sense the end of World War II (1945). His friend and government assigned liaison Rick Jones is trying to explain modern computers and the internet to him when a terrorist organization known as HYDRA strikes. 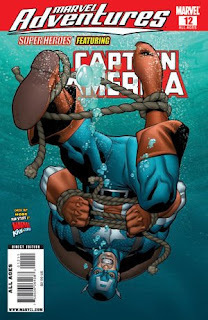 Cap and Rick are sucked into HYDRA's Web Page and find themselves fighting for their lives in a virtual world that is to strange to describe. 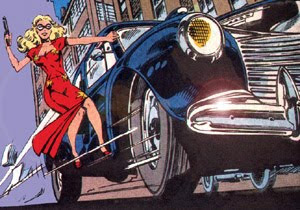 The second story takes place during World War II and stars Cap and his teenage sidekick Bucky. While on leave from the War, they run into a sadistic German killing machine right here in the good old U.S. of A. Two fun stories that I really enjoyed. If you can get ahold of this comic at a library or comic book store, I highly recommend it. Another thing I'm excited about is another Bone book by Jeff Smith that has just been put out by Scholastic. Rose by Jeff Smith and Charles Vess - I thought the series was over with Volume 9 Crown of Horns, but Jeff Smith wrote a prequel to the series with Charles Vess doing the art work entitled "Rose." Now if the name Rose does not sound familiar how about Gran'ma Ben (Rose is Gran'ma Ben's name). The story basically focuses on Rose and her sister Briar. 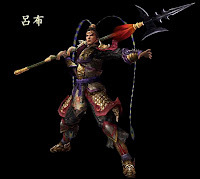 They are both in this story training to master the ways of the Veni-Yan who are seers into the Dreaming. Rose proves to be more adept in learning their ways much to the displeasure of Briar. The Veni-Vang have felt through the Dreaming the coming of an emancipator of "The Lord of Locust" and fear that Rose or Briar may be this entity. Through the story we learn who the emancipator is and the events that lead up to the first Bone GN Out from Boneville. What is really special about this story is we get more insight into Gran'ma Ben's relationship with her sister Briar and we see the mistakes Gran'ma Ben makes that lead to her becoming the heroic figure we know from the Bone Series. We also get to see some familiar characters in The Red Dragon, a young Lucius and the Rat Creatures along with meeting some new ones in Cleo and Euclid (Rose's two hounds that she can talk to) and the evil River Dragon Balsaad. I highly recommend this book for both Bone fans and those who are not yet. Star Wars Camp Grand Finale! And what a GRAND finale it was! We all had a great time! A movie, a very interesting speaker, and a light saber duel. What more could you want? So in the interest of keeping peace and bringing balance to the Force, Darth Bill, Master Jedi Zack, and I will read Frankie Pickle and the Closet of Doom together and write a post about it. It seems like a fun book that we'd all enjoy. I hope so. I'd hate for another sith-jedi war to break out. After that, Professor Northcott from UNCC delivered a fascinating lecture on the stages of The Hero's Journey and how Luke Skywalker fit into them. And she wasn't some old fuddy-duddy professor either--she's been a life-long comics and sci-fi fan as well as having been at Dragon Con for 5 years! PLUS, she saw Star Wars Episode IV twenty-three times in the theatres! She knows what she's talking about! Then we had snacks and watched a Clone Wars animated movie. Master Jedi Zack's turn now! The camps were a blast. 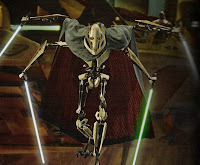 Of course the Jedi won out throughout the movie, us Jedi may appear to be beaten at times, but we always come back to save the day. 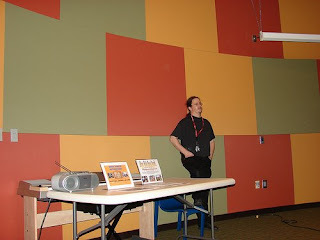 Thanks CARLMAN (and I guess Darth Bill) for having me over to ImaginOn for the program. The camps held here at Matthews were a lot of fun, and now there is a whole group of young Jedi to keep an eye on that Sithhead Bill! Here are a few pictures from the final camp. Professor Northcott talks about Luke Skywalker! As you can see, a good time was had by all, Jedi and Sith alike. We were glad we could all be there togetherwith the guys. Watch for our joint post on the Frankie Pickle book! 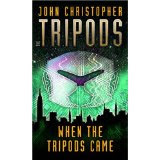 ...is the third book in the Tripods series. The first two books rocked and so does this one. Young Will Parker, his cousin Henry, and his friend Beanpole gather with the rebels scattered around the world to finally overthrow the alien Masters who have taken over the whole Earth. The rebel scientists have rediscovered the science that was lost when the Masters took over, so now they have some technology to help their fight. But the fight is incredibly desperate--the Masters live in nearly-indestructible cities, have the powerful Tripods to fight in, and may not have any weaknesses. The rebel leaders do come up with a plan, but it's so incredibly difficult that it would be almost impossible. And it's up to Will and his friends to carry it out! Wow! You guys will really enjoy this story!! I did, for absolutely sure! The Pool of Fire by John Christopher. We have copies. So do the other libraries. Go get them. Really. Go get them. And if you want to see reviews of the first two books, click on the tab beneath this post. BTW, there is one more book in this series. It's a prequel called When the Tripods Came. 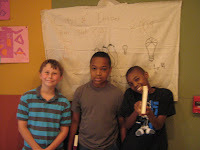 Hey, guys, it's Carl and here are Ethan (aka dragonslayer), Leland, and Noah, our faithful reader guys and members of our City of Ember Boys' Book Club, standing in front of the banner they made for our club. 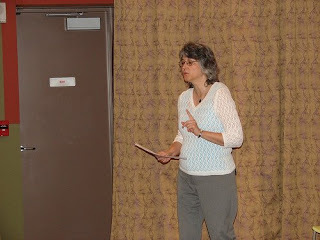 We had a really good time at our meeting last Saturday. The book was The Prophet of Yonwood, the third in The City of Ember series. Of course we didn't just sit down and start talking--the meeting began with a game called Hide the Bomb. Since this book talks a lot about terrorists and world-wide war, we divided the guys into Terrorists and Agents. The Terrorist hid a picture of a bomb in the room and the Agent had 2 minutes to find it. A lot of the Agents found the bomb (note to players: laughing when an Agent gets near your bomb is a sure giveaway!) but the Terrorists got smarter and sneakier with each round. Everyone got a chance to be an Agent and Terrorist, even me. A lot of fun. Then we had snacks and settled in to a really good discussion. This book was all about the world on the brink of a global war and a girl and her aunt inheriting an old house in a small town. We talked about what life would be like if a world war were coming--could life go on as normal, what was life like in World Wars I and II, did the guys know anyone deployed in Iraq. (two of the guys did) As I said, it was a really good discussion. AND we had an excellent belching competition! Ethan even proved that he could burp the alphabet. Now that's what I call a GUY book club!! The next book is The Diamond of Darkhold. We hope to have the next meeting in September and we'll be sure to announce it ahead of time. Da "WINNER!" The # 1 Bum! The votes are in, guys, and CARL is the "winner" of The Battle of the Bums. Yes, by an overwhelming majority, the rock-and-roll public says that Carl is a WORSE SINGER THAN BILL!! Now for the "prize"--Carl gets to sing a song and wear an outfit picked out by ELLEN. The same Ellen who went before the Court of Cosmic Justice. Who was called "Evil Ellen." Who gets a chance for REVENGE!! What will she make him wear?? And what will she make him SING??? Probably something about BEING A GIRL!!! Oh, man, I'd better be afraid!! VERY AFRAID!!! LORD VADER Writes Once More! I just finished the last book in the Harry Potter series. Harry Potter and the Deathly Hallows was full of action from beginning to end. It was very good and I would recommend this book to other people. The last battle in this book was awesome. I loved the book, but I'm kind of disappointed it was the last book in the series. At least I can look forward to the movie. Mikie (a.k.a. Lord Vader) P.S. I haven't seen the Half Blood Prince yet but hopefully will soon. Thanks, Lord Vader! A lot of people liked this one (including Zack), but Bill would disagree. He called it "Harry Potter and the Endless Camping Trip!" If you want to see what he, Zack, and other reader guys said, click on the tab underneath this post. And don't for get to vote in The Battle of The Bums. You have until 6:00 PM today. We'll announce the "winner" on Monday.